CHARLIEHORSE FARM FAMILY/FRIEND COMPOUND borders HIGHWAY 475 FEATURING TWO PRIVATE RESIDENCES AND anywhere from 15 UP TO 30 BEAUTIFUL ACRES of quality soils, high and dry. Listing is for 15 acres and can be adjusted down to 5 acres or up to 30 acres. Long, paved driveway running alongside pristine pastures studded with meandering, grand oak trees which shield the two homes from the fast pace world. All powerlines are underground and property features two fresh water wells. The two architecturally designed homes provide wonderful, spacious floor plans with attention to detail. The open kitchen/family rooms are a focal point for informal gathering, while the adjacent dining room offers comfortable formality in split floor plans with two guest rooms and bathrooms.Main home is 3749 sq ft with an oversized master suite & bath featuring large Jacuzzi tub, separate shower, and two sinks. The area flows into one of two offices, well-orchestrated laundry room, and then to second office adjoining two car garage. OVERSIZED PORCH AREAS on front and back of each home invite you to soak up the tranquility of the pastures with perfectly scattered large, shady oak trees. 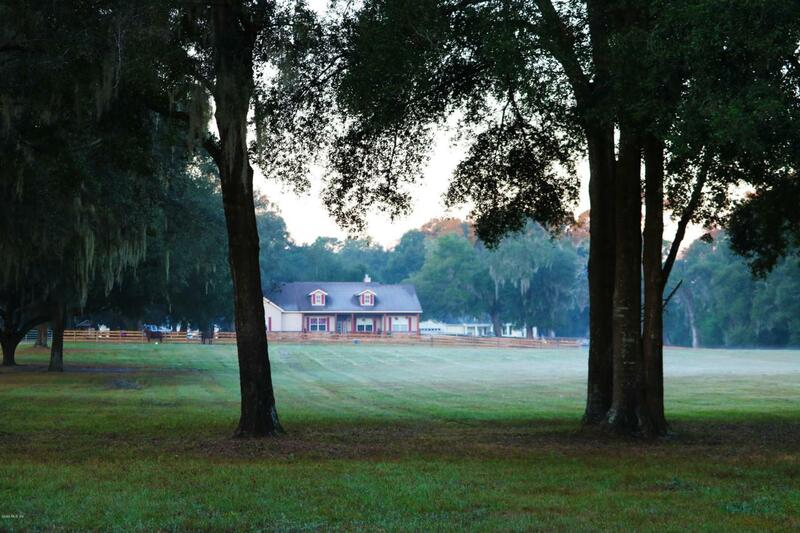 The serene setting will surprise you with convenience of outstanding location within 3 miles to horse, hiking and bike trails starting at the Florida Horse Park going into the MRC Greenways /Trails and is considered a state park. This unique 110-mile nature corridor stretches from the Gulf of Mexico to the St. John's River. Farm is only: 3 mi to I-75/ 9 mi to Ocala / 7 mi. to The Villages / 15 mi. to Turnpike. As neighbor, listing agent knows area well, and happy to share local knowledge.